My motto with pretty much everything in life is “anything to make things easier”. If there is a shortcut, I’ll take it! If there is a gadget, I’ll buy it! So when I was contacted by Zyliss about their EasyPull Food Processor, I was intrigued to find out more about it and excited to put it to use. The Zyliss EasyPull is a manual food processor – that means you don’t have to worry about having a power source – great for taking away on self-catering or camping holidays! 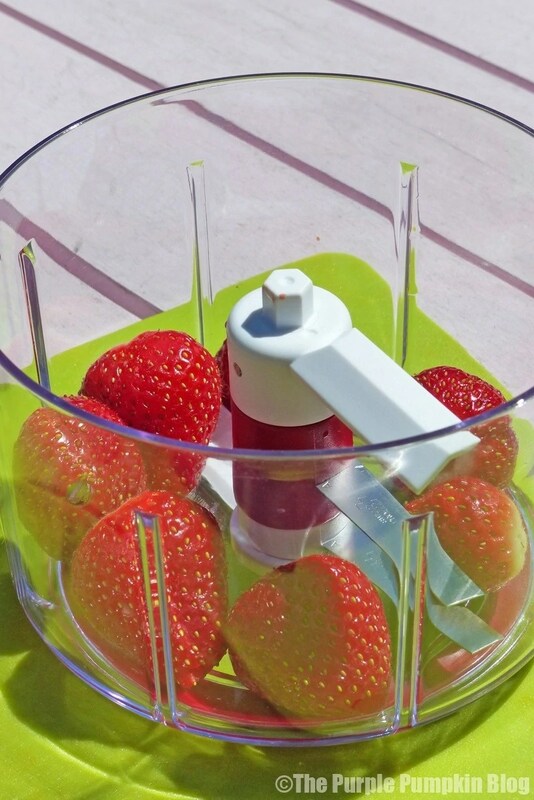 You can mix, chop, blend and puree food, by simply pulling the handle. It has a patented Swiss design blade for easy chopping, with sweeper arms to keep food in the path of the blades. Pulling the handle 3-5 times will yield a coarse chop, and 8-10 times for a finer chop. With a 750ml capacity non-slip base, it is great for small jobs, saving the hassle of dragging out and setting up larger food processors, and is very easy to clean. The base and the blades can go into the dishwasher too, but the lid cannot. Simply give a quick rinse under the tap and wipe clean. Check out the Zyliss EasyPull Food Processor in action in the video below. 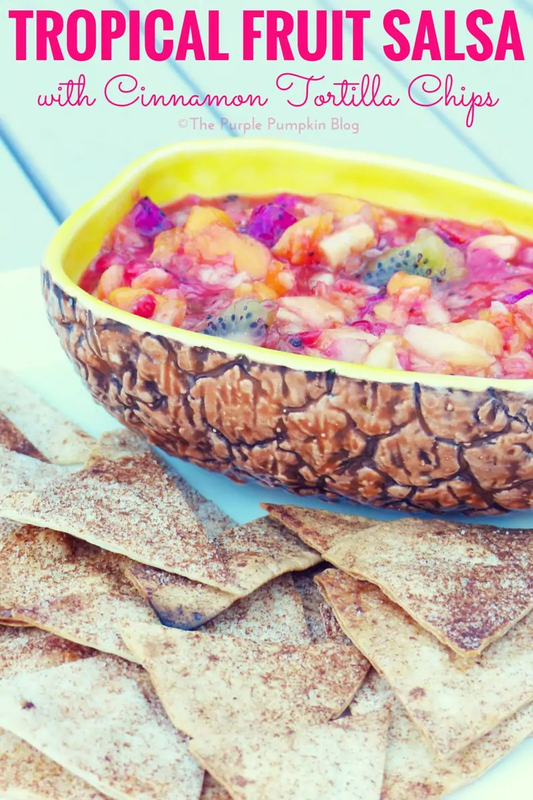 I made a couple of dishes using the EasyPull, and I’ll be sharing those shortly, but first, this recipe is for a Tropical Fruit Salsa with Cinnamon Tortilla Chips. It’s something that I see from time to time pop up on Pinterest, and when I was asked to review the EasyPull, it’s one of the first things that came to mind, as a lot of chopping would be involved! I took the food processor out of its box, and was very happy to see the blade had its own special safety case – the blade is very sharp. I lifted the lid from the base and popped the blade inside, ensuring that they two blades were lined up. Then it was go-time as far as fruit chopping was concerned! I enlisted the help of my husband to be the EasyPull operator so that I could take some photographs. So he is the hand model you see in the ones throughout the post! 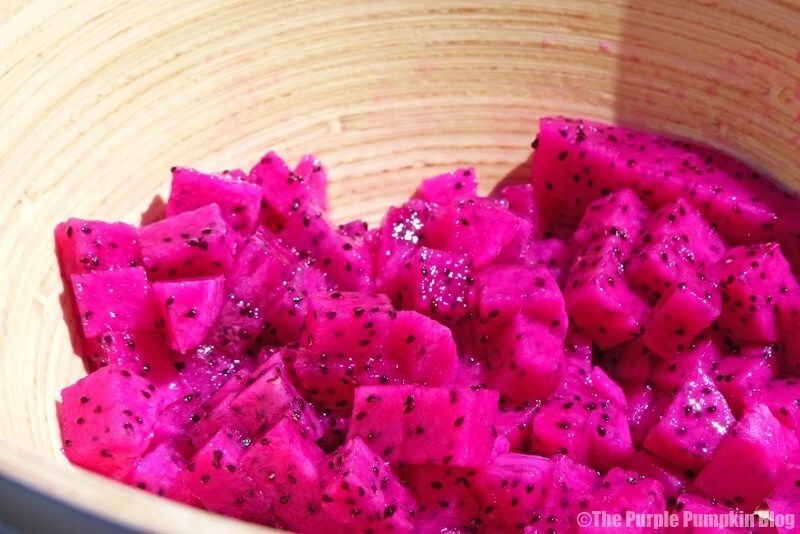 I started with the dragon fruit, which usually has white flesh, but for some reason, the one I bought was bright pink! 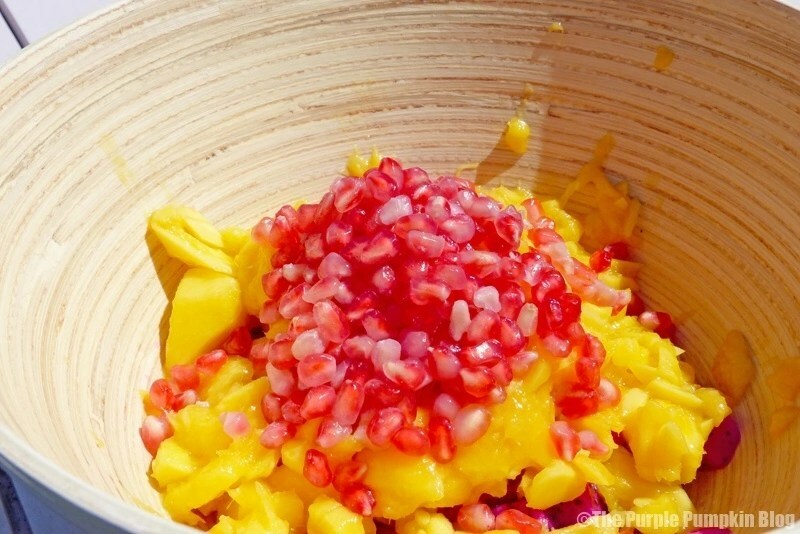 I peeled and chopped all of the fruit into large chunks before placing inside the food processor, and after just a couple of pulls, it was done. I loved how, even though the fruit was quite soft, the EasyPull’s blades didn’t squash it down to a mush. Next, the giant mango! Another peel, and rough chop so that the pieces could fit inside the EasyPull. The mango was a bit soft and a bit firm, so that gave different size pieces after a few pulls of the handle, but it’s all good! It got dumped into the bowl along with the pomegranate seeds. I was going to chop the coconut down a bit, but upon opening the packet, there was a nasty smell to it, and it felt all slimy – not good at all. Even though the package said it was in date, it clearly wasn’t. 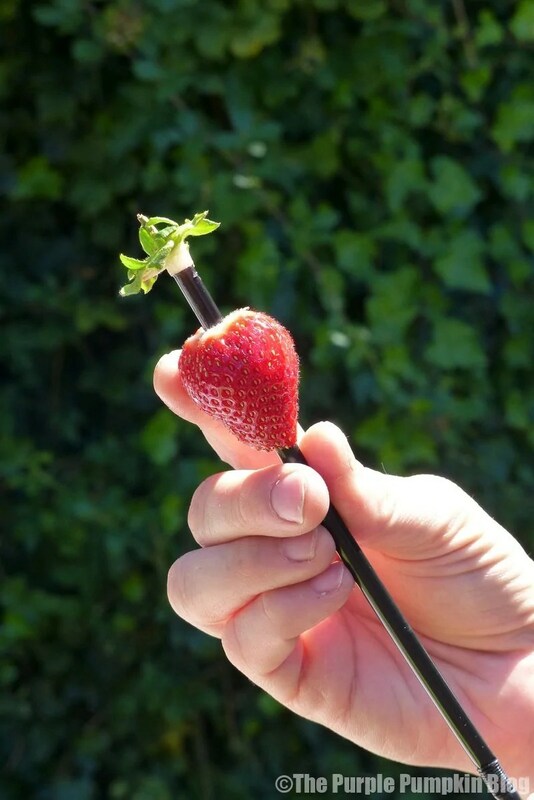 Strawberries were next, hulling them first with a straw (such a nifty little trick!) and popping them in whole, into the EasyPull. 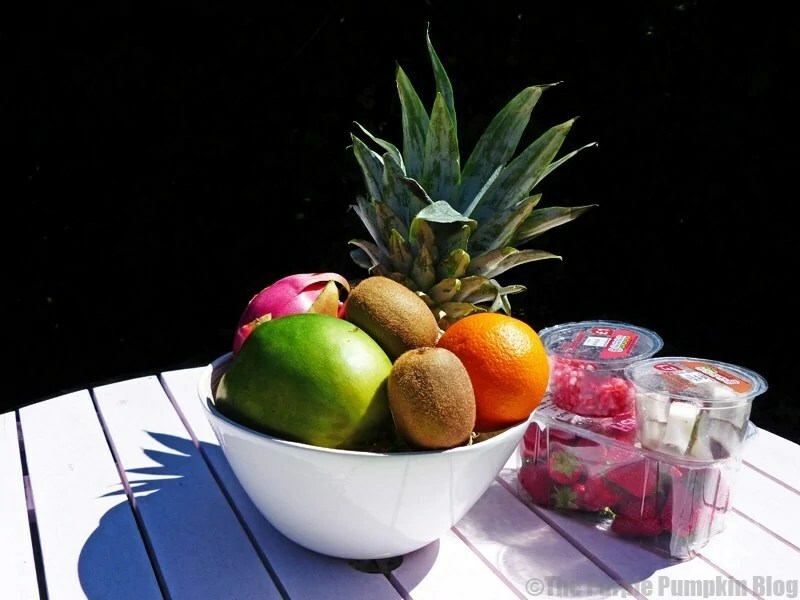 They went into the bowl with the other chopped fruit, and then some kiwi fruit and the pineapple followed. Finally, hubs reduced the orange to pretty much juice, because, that just sorta happened, but it was okay as it made a bit of a sauce for the salsa. I mixed everything together and placed the bowl of tropical fruit salsa into the fridge to chill. 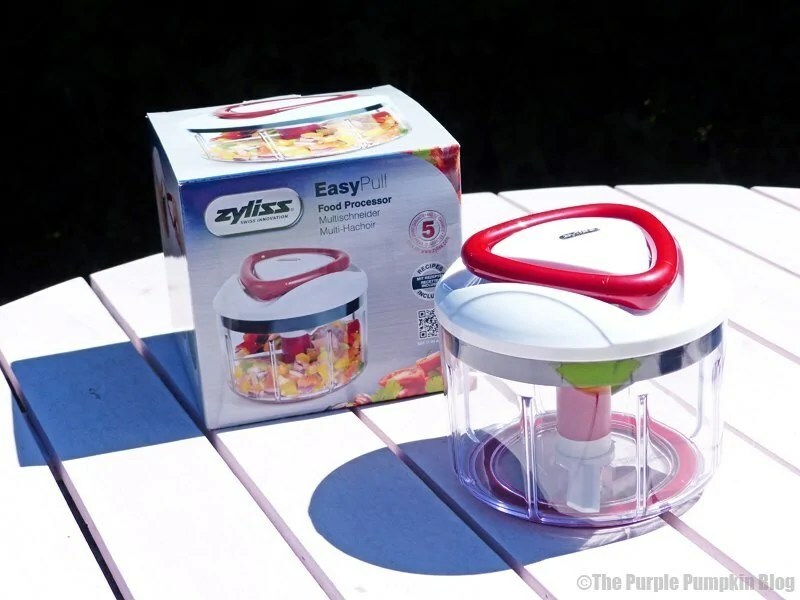 Having the Zyliss EasyPull Food Processor made chopping up all of the fruit a breeze – I dread to think how long it would have taken me to chop it all into tiny pieces with a knife! A considerably longer time I would say. I also had a go using the EasyPull, and it was exactly that – easy to pull. I love how small and compact it is, and I know that it is going to get a lot of use in the kitchen. One of my least favourite tasks is chopping onion and garlic, so this food processor is going to make my life a lot easier! The Zyliss EasyPull retails for around £24.99 and I think is worth its weight in gold – a great kitchen gadget to have. The Cinnamon Tortilla Chips were very easy to make. I don’t have any photographs of the process… but all you do is take a ready made flour tortilla; brush it with a little melted butter and sprinkle over a mixture of ground cinnamon and sugar. The ratio of cinnamon to sugar will be down to your individual taste. Then cut the tortilla into triangles, and place these on a baking sheet. Pop into a hot oven (the highest it will go) for a couple of minutes until it the chips are crispy. Continue the process until you have the amount of cinnamon tortilla chips you need. 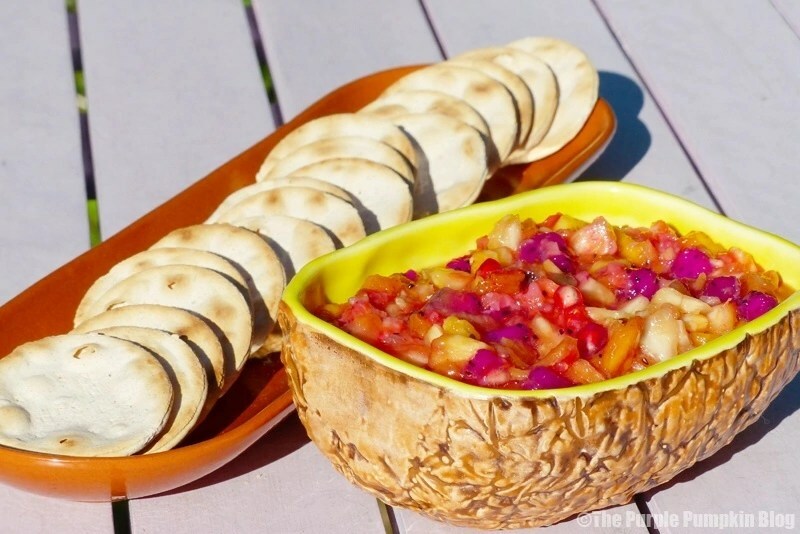 And if you don’t want to make your own chips, you can buy any kind of sweet cracker to go with the tropical fruit salsa. The ones in the photo below are Jamaican water crackers, which had a hint of cinnamon in them too. 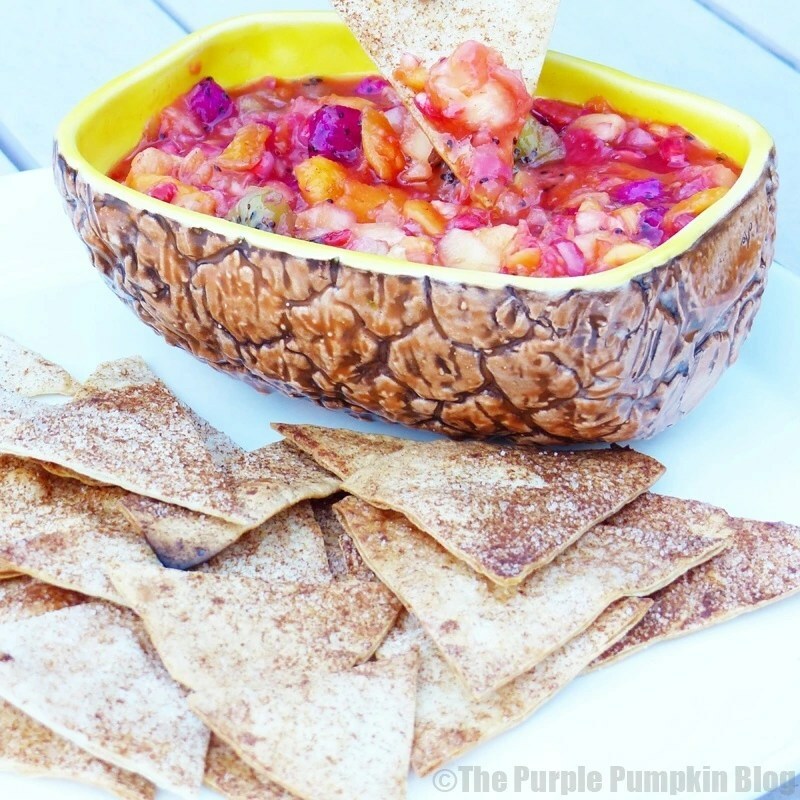 Use any combination of fruit you like, in whichever quantity you like - this recipe is more of a guideline! 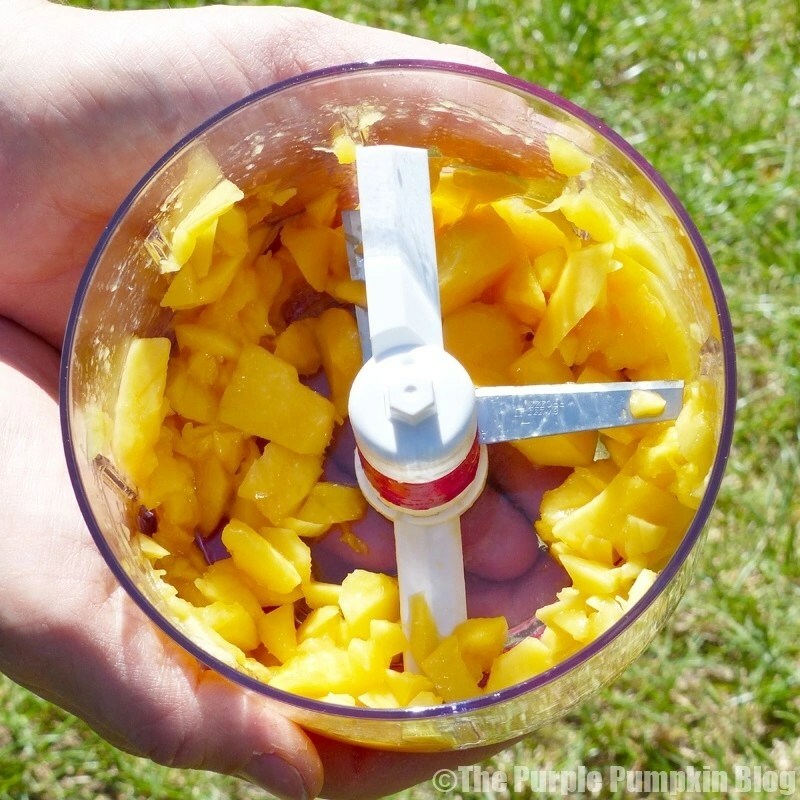 Prepare the fruit by peeling, removing pith, taking out stones and seeds, and cutting into large chunks to fit into the Zyliss EasyPull Food Processor. Cut one fruit at a time into small pieces, 3 to 5 pulls should be enough. Place everything into a bowl and mix together well. Chill in the refrigerator until required. To make the cinnamon tortilla chips, lay the tortilla out and brush with melted butter. Sprinkle with sugar and ground cinnamon to your personal taste. Cut into triangles and place onto a baking sheet. Bake in a hot oven for a couple of minutes until crispy. 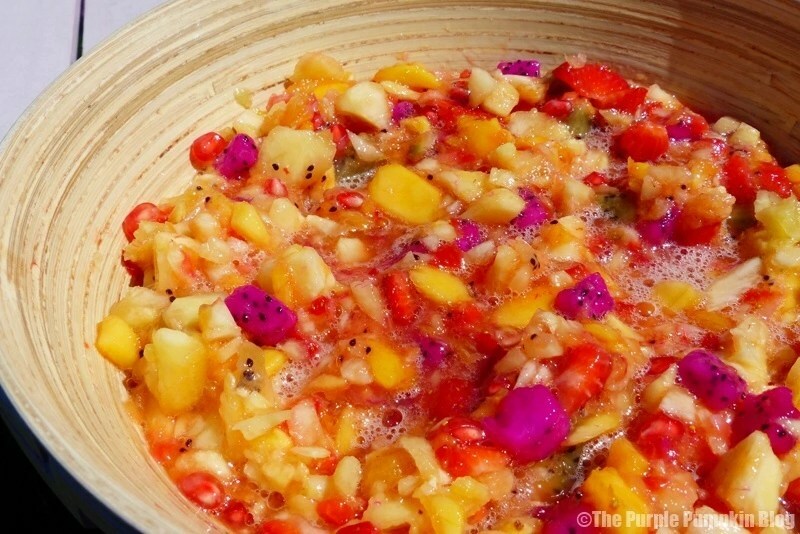 Allow to cool and serve with the tropical fruit salsa. Disclosure: Collaborative post in association with Zyliss. I was sent this product to review. All thoughts are my own honest opinions. :D I’m glad to know my recipes and photos work as they should!